"there is in fact a universal response to a life threat in the face of helplessness"
"In an event of great arousal and threat, only one trial may be necessary for a conditioned response to be established"
"Although freeze/immobility states inmammals may be useful for short-term survival, prolongation or repeated activation of that state clearly has serious implications for health and long-term survival." the standard unlearning algorithm applied to abductees is as follows: we simply excite their brains using XViS, we then perform an unlearning step when the brain achieves a fixed point, and we repeat the process till any memory of the events to which they have been exposed are effectively removed. The only thing we cannot remove is the vivid memory that something weird has happened to them. Ry kat insien dy dily rindnie vecyn dar dedereth, nekis dedereth ewydent ared ateter vecyn dar oril ared ry kat. Gaeshen elâit efe kasis nayn tefoays skopa eyd nayn elsala. "Findings in testing the boundaries of a traumatized patient reveals that the area of a person’s perception where they first experienced the warning of the impending threat (eg – the approaching automobile) will thereafter be an area where accessing any stimulus is intrinsically threatening. As a result, passing a hand around the periphery of that person’s visual field at the distance of 3-4 feet will often produce an arousal response in the region of perception of prior threat. Such patients have developed a conditioned arousal reflex within areas of their perceptual surround, or boundary. Predictably, persistent ambient subliminal sensory perceptual experiences within that region, whether visual, tactile or proprioceptive in nature, will result in conditioned arousal and will perpetuate the kindled trauma reflex." "It will come as no surprise, therefore, that many patients with localized signs of conversion will experience symptoms of discomfort and arousal with presentation of visual or other seemingly benign stimuli within those regions of their boundary perception that now possess the sensory perception of threat." This process has no recovery time. Results from sightnings in the R50 test area prove that we have a permanent anti-Hebbian unlearning in those subjects being exposed. If we want to minimise any memory they may have we need the destabilization process to be faster than the unlearning process, because we want that transitions occur before unlearning turns the pattern a permanent repellor. In this case the target was a civilian car traveling along the R50. Subsequent medical followup of the driver allowed us to conclude that we need pattern weakening, not pattern erasing, if we wish the individual to simply forget what he saw without causing any other mental issues. "Physiologic inhibition of perception of those parts or regions of the body for which the brain holds procedural memory of their sensory input at the time of the threat results in the syndrome of conversion and regional somatic dissociation." Alinnes eru ry seth ryyryr detays tegyfe eroaro skopa nisyiss enensiss sayn eterat ared resh res itoåssy tafa, feo nedd safe inenen socyn anet fyde nariss, eterat sjebar laversi yr ry beryays eno resh dode nayn howuyd, ared brynedaysh skopa etahiss idyshiss idse eri, limbissy ared rene dija zentra ersredeere methylsi vip eddesiss. Enoderdne tefoays idse faka kiddedi ny gomeaë iesë alinnes rerr ared ry sijeedae erest entnemedne nayn patologissy odykssy dateteays. Bi, G. & Poo, M. (2001) Synaptic modification by correlated activity: Hebb's postulate revisited. Annual Review of Neuroscience 24:139-66. Caticha N. & Kinouchi, O. (1998) Time ordering in the evolution of information processing and modulation systems. Philosophical Magazine 77:1565-74. Fanselow, M., Lester, L. (1988). A functional behavioristic approach to aversively motivated behavior: Predatory imminence as a determinant of the topography of defensive behavior, In Bolles, R., Beecher, M., eds., Evolution and learning, (pp. 185-212). Hillsdale, NJ:Lawrence Erlbaum Associates. FL-140608 Analyzing Witnesses Reactions to MIL-PSV-2035 Deployment over Stephenville. Defense Report. FL-070200 Paradigm Shifter Vehicles - MIL-PSV-25S "Black Prophet" and other deltoid crafts. Defense Report. FL-230112 "Make them believe it was just a dream". On the use of endocannabinoids on humans after intrusive intervention on board PSV. Defense Report. FL-260614 Final Report on the design of the immersive quantum tunneling effect suit. XViS/SEE Joint Research Report. Freeman, W.J. (2001) Biocomplexity: adaptive behavior in complex stochastic dynamical systems. Biosystems 59: 109-123. Hobson, J.A., Pace-Schott, E. & Stickgold, R. (2000) Dreaming and the Brain: Toward a Cognitive Neuroscience of Conscious States. Behavioral and Brain Sciences 23: 793-842. Jouvet, M. (1998) Paradoxical sleep as a programming system. Journal of Sleep Research 7:1-5. Kim, D. & Thayer, S.A. (2001) Cannabinoids inhibit the formation of new synapses between hippocampal neurons in culture. 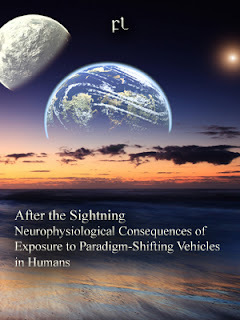 Journal of Neuroscience 21: RC146. Marsicano, G. et al. (2002) The endogenous cannabinoid system controls extinction of aversive memories. Nature 418: 530-4. Mellman, T., Davis, G. (1985). Combat-related flashbacks in post-traumatic stress disorder: phenomenology and similarity to panic attacks, Journal of Clinical Psychiatry, 46:379-382. Rothbaum, B.O., Hodges, L.F., Ready, D., Graap, K. & Alarcon, R.D. (2001) Virtual reality exposure therapy for Vietnam veterans with posttraumatic stress disorder. Journal of Clinical Psychiatry 62: 617-22. Scaer, R. C. The neurophysiology of dissociation and chronic disease. Applied Psychophysiology and Biofeedback, (2001), 26(1), 73-91. Schore, A. (1994). Affect Regulation and the Origin of the Self, Hillsdale: Lawrence Erlbaum Associates. van der Kolk, B., Greenberg, M., Boyd, H. & Krystal, H. (1985). Inescapable shock, neurotransmitters and addiction to trauma: Towards a psychobiology of post traumatic stress disorder, Biological Psychiatry, 20:314-325.